Hawaii Intends To File Lawsuit Against Trump's Revised Travel Ban : The Two-Way Hawaii's attorney general calls Trump's executive order "Muslim Ban 2.0." The suit argues that the ban subjects Muslims to discrimination and second-class treatment, and damages the state's economy. 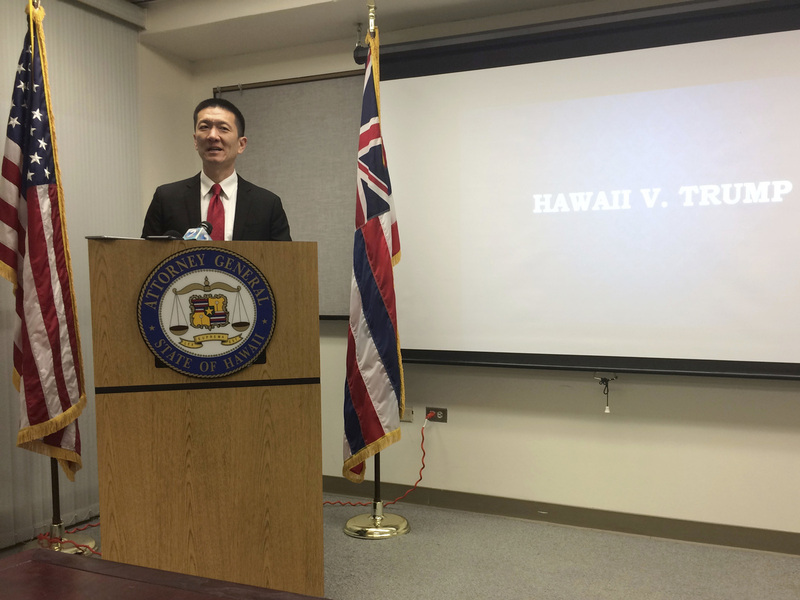 Hawaii Attorney General Doug Chin speaks at a news conference in Honolulu last month. On Tuesday, Chin filed a motion against Trump's revised ban. Trump's original ban, signed in January, caused immediate chaos at airports across the country before being frozen by a challenge from Washington State. The revised executive order, which Trump signed on Monday, has been rewritten to make it more difficult to challenge in court. But Hawaii hopes it has crafted a legal argument that can stop the new order from going into effect on March 16. "This new executive order is nothing more than Muslim Ban 2.0," said Hawaii Attorney General Doug Chin in a statement. "Under the pretense of national security, it still targets immigrants and refugees. It leaves the door open for even further restrictions. Our office is reviewing the new order and will decide what next steps may be necessary." The Justice Department declined comment on the lawsuit. The new order doesn't allow visas for people from Iran, Syria, Somalia, Sudan, Yemen and Libya. It also temporarily shuts down America's refugee program, and reduces the number of refugees it will admit this fiscal year to 50,000, instead of the 110,000 the Obama administration had planned. Is Trump's Revised Travel Order Disguising A Muslim Ban? Hawaii's lawsuit argues that while the language in Trump's revised executive order has changed, it is merely the president's latest effort to enact what he promised early in his campaign: a Muslim ban. Hawaii's lawsuit names Ismail Elshikh as a co-plaintiff, "because the Executive Order inflicts a grave injury on Muslims in Hawai'i, including Dr. Elshikh, his Family, and members of his Mosque." Elshikh is the Imam of the Muslim Association of Hawaii. "discrimination and second-class treatment, in violation of both the Constitution and the Immigration and Nationality Act. The Order denies them their right to associate with family members overseas on the basis of their religion and national origin. And it results in their having to live in a country and in a State where there is the perception that the Government has established a disfavored religion." And by disfavoring a religion, the suit argues, Trump's executive order is establishing a state religion, in violation of the Establishment Clause of the First Amendment. Hawaii's economy leans heavily on tourism, and the lawsuit cites both economic and familial hindrances caused by the ban. "It is damaging Hawaii's institutions, harming its economy, and eroding Hawaii's sovereign interests in maintaining the separation between church and state as well as in welcoming persons from all nations around the world into the fabric of its society." The plaintiffs seek an order that would invalidate the portions of the executive order that they challenge in the lawsuit, and have proposed a hearing for March 15 — the day before the order is to go into effect. The new executive order "is infected with the same legal problems as the first Order — undermining bedrock constitutional and statutory guarantees," the state argues. "The Executive Order purports to protect the country from terrorism, but sweeps in millions of people who have absolutely no connection to terrorism."